Apple's new tie-up with Major League Baseball seems to have brought more than dugout cred for the iPad —the company's virtual assistant, Siri, now has access to a trove of modern-day and historic baseball statistics. 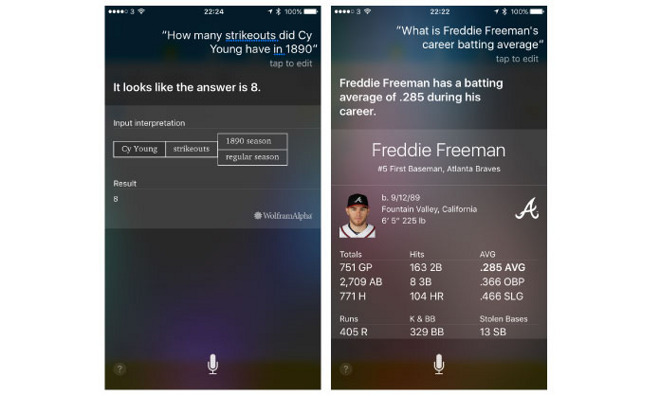 Siri can now cough up data for thousands of MLB players, from stars of today —like Freddie Freeman —to old-school hurlers like Cy Young. As noted by CNET's aptly-named Terry Collins, a total of 28 leagues are supported. Last week, Apple revealed a multi-year agreement with MLB that will see the iPad Pro certified for use in the dugout during games. Each iPad Pro will come with a custom iOS app —dubbed "Dugout" —developed by MLB Advanced Media in partnership with Apple.